The project began in 2015, when the Communications Workers of America (CWA) asked the Labor Institute to conduct five half-day sessions for 30 Verizon workers based on a draft of Runaway Inequality. As the course ended the participants asked if they could become trainers as well. The CWA then committed significant resources to partner with the Labor Institute to train 60 workers as trainers who in turn would conduct 8-hour runaway inequality workshops for 1,000 CWA members from around the country. That training continues. The CWA is sharing the workshops with allied groups. It has sponsored train-the-trainer programs for Citizen Action New York, Jobs for Justice in Detroit, and a joint train-the-trainer program with the United Steelworkers, the CWA and the Sierra Club in California. In addition, it sponsored an 8-hour course in Spanish and English for 150 United Automobile Workers from New England, New York and Puerto Rico. In the coming year, the CWA will be helping additional community groups and unions start their own runaway inequality educational programs. The New Jersey Educational Association in cooperation with the New Jersey Work Environment Council has conducted three train-the-trainer programs with the goal of reaching 2,000 New Jersey labor and community activists. The National Nurses United purchased 5,500 books which were distributed to the participants at the 2016 and 2017 Peoples Summit in Chicago. Runaway inequality will not cure itself. There is no hidden mechanism that will right the ship. Instead, the economy is now structured so that financial and corporate elites will continually gain more and more wealth and power at our expense. The financial strip-mining of our economy (how economic elites siphon wealth from our workplaces, families and communities) impacts all of us and all of our issues — from climate change, to mass incarceration, to job loss, to declining incomes, to labor rights, to student loans. It will take a massive organized movement to take back our country from these financial and corporate elites. That means no matter what our individual identity (labor unionist, environmentalist, racial justice activist, feminist, etc. ), we also need to take on the identity of movement builder. We all must come together or we all lose. Coming together requires that we also fight discrimination based on race, ethnicity, gender, and sexual orientation. The denial of basic human rights to any group serves to divide us. It cripples our movement building efforts while enhancing the power of economic elites. This book and related training programs can not by themselves create such a movement. But we can play a vital and necessary role. We can build its educational infrastructure. Our model is the populist movement of the late 19th century, which united small farmers, black and white, in the South and Midwest in an epic battle against the moneyed interests. These home-grown populists wanted a new economic system based on public ownership of railroads and banks, and cooperative local enterprises that would serve the needs of small farming communities and factory workers. To build their movement, the populists sent 6,000 educators to help small communities learn how to reverse runaway inequality. Because of their efforts, a powerful movement grew to take back our country from the corporate and financial elites — an effort that ultimately culminated in social security, wage and hour laws, the regulation of Wall Street and large corporations, and the protection of working people on the job. The financial and corporate elites fought back, and in the last 50 years have eroded much of these hard-won protections. Our problem today is much the same as it was for the populists, as is our educational task. We need tens of thousands of educators who can help the American people understand that runaway inequality is not an act of God, but rather the willful result of corporate and financial greed. Putting 50,000 books in circulation is not enough. We need 50,000 educators to engage in live discussions with friends, neighbors and colleagues. We need to reach out to all those who are left behind by runaway inequality. And most importantly we need you to become one of those educators. To move towards that goal, we’ve created the runawayinequality.org website to recruit and train new trainers, and to provide curricula and supporting materials. We’re also stepping up our efforts to conduct one- and two-day train-the-trainer sessions around the country. Sustained movement building on a large scale is foreign to most of us. For more than a generation we’ve grown accustomed to the neoliberal free-market vision that has narrowed our sense of the possible. It taught us that it’s OK for students to go deeply in debt; that it’s natural to have the largest prison population in the world; that it’s inevitable to have a crumbling infrastructure; and that it is impossible to prevent corporations from shifting our jobs to low wage areas with poor environmental protections. Most importantly, it has conditioned us to think small about movement building ― to work in our own issue silos and not link up together. But we now live in an era in which thinking small does not work. Unless we build a much bigger, united and sustainable movement, other big ideas will take hold, ranging from white supremacy to trickle-down economics for the rich. Historians may look back at this time and say that this was the era during which runaway inequality replaced the American Dream. However, if we do our work well, it could instead be viewed as the time when a new movement to reverse runaway inequality took hold. It’s on us. We get to choose whether to continue working only in our issue silos or whether we join together to build a broader, bolder movement. This book and the educational projects that flow from it can help build the educational infrastructure needed for that bigger, bolder movement. Please join us at runawayinequality.org to help spread the word. It’s a great honor to be a part of this collective effort. Read the whole book. 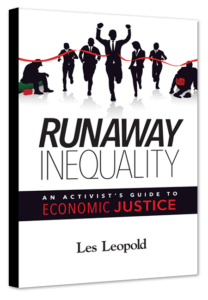 Get your copy of Runaway Inequality now!